251: Garden Tour with Bari J and Country Lane…. Welcome to today’s post!! Thanks for dropping by the Blue Nickel! 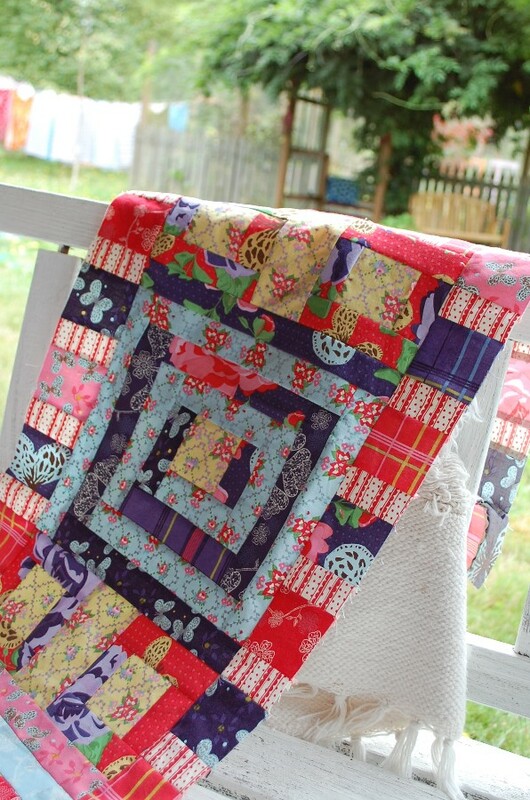 Today it is all about my friend Bari J Ackerman and her third line of fabric Country Lane. I was lucky enough to be able to join along in Bari’s Garden Blog Tour with Country Lane. I have my first down-loadable pattern that is right here at the Blue Nickel for you featuring Country Lane(i.e. not on some other site, you have to come here directly to get it, Yeah!) 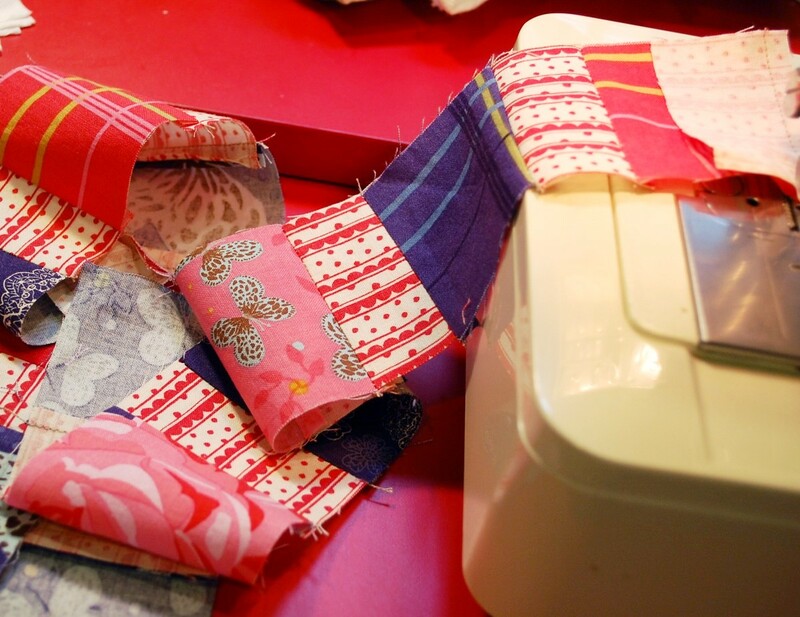 , a quick interview that I snagged from Bari for as she is rushing around to get ready for her first booth at Fall Quilt Market, AND a prize of fabric from her second line, Art Journal, as well as one of Bari’s Premiere sewing patterns. SO on to the interview…. BNS: So welcome to Blue Nickel Studios, Bari! Bari: Thanks, Scott, happy to be here! BNS: I know you are super busy, getting ready for Quilt Market and your first booth set up there, so let’s go straight to the questions. First off, when you were in your teens, who stole your heart via the pop culture at the time? Is your husband anything like your former heart-throb? Bari: You are going to be surprised… Billy Idol. And Super Husband is about the furthest thing from Billy Idol you could get. BNS: When you are creating and designing, do you have a set of favorite tunes or CD’s you rock the house down with?or is it all Peace and Tranquility at BariJ HQ? Bari: I sometimes start the day with Black Eyed Peas, Boom Boom Pow. BNS: You just wrote a book Inspired to Sew due out in January 2011. What surprised you the most in the process of writing this bookshelf-must-have? Bari: It always takes way more time and energy than you think when you first set out to do something. This was no exception. It was grueling. BNS: Your favorite midnight snack while working late into the night? Bari: Popcorn…although I tend to just work and work without eating until I realize I totally forgot to have a meal. BNS: You dig vintage doodaderies, right? What has been your most fabulous find? Can you share some pictures of some of your favorites? 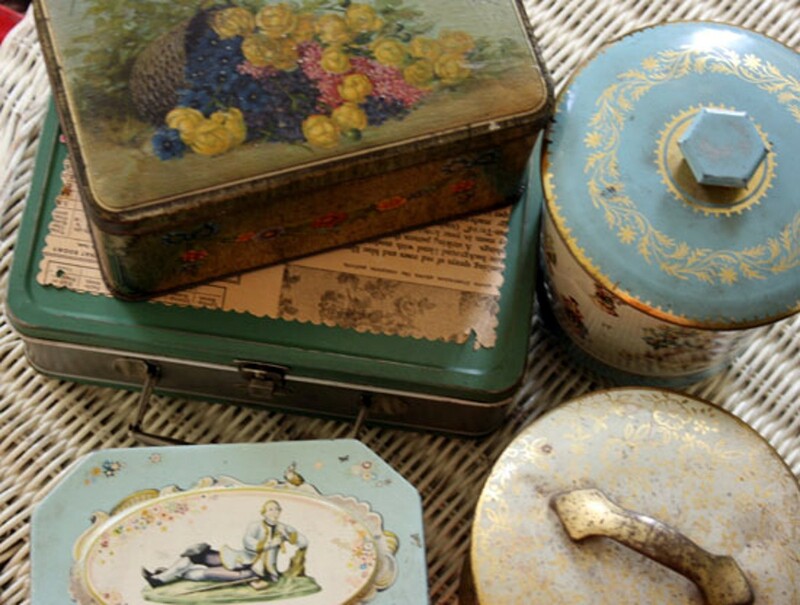 Bari: I collect milk glass and vintage tins. I have limited myself at this point to only pink milk glass though because it’s harder to find. 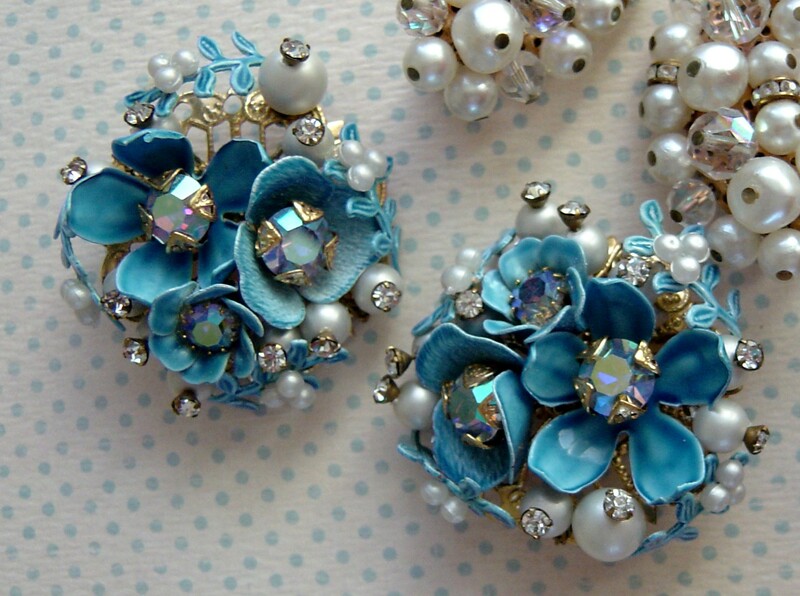 I also love vintage jewelry. these next two pictures are courtesy of Bari J Designs. BNS: Thanks for sharing those great photos Bari! Next question, what do you see in the future for the Bari J empire and your fans? Bari: I am working on surface designs for paper, home goods, and more. BNS: What do you want most for your daughters to take from your home when they grow up, besides their laundry? Bari: That you can do anything you set your mind to. BNS: Good words for us all to live by! Last question, Sound of Music, West Side Story, Little Shop or Horrors, or Rocky Horror Picture Show? Bari: West Side Story, definitely. BNS: Well, I know your time is short these days getting ready for Quilt Market, so we’ll wrap this up. Thank you so much for stopping by the Blue Nickel on your Country Lane Garden Tour. We all definitely look forward to seeing what is up your sleeve in the future! Bari: Thanks for having me, Scott, it’s always a pleasure chatting with you. And when you make your table runner don’t forget to post a picture on the Blue Nickel Studios group page if you make it out of any fabrics at all and on Bari’s Country Lane group page if you make it out of Country Lane. 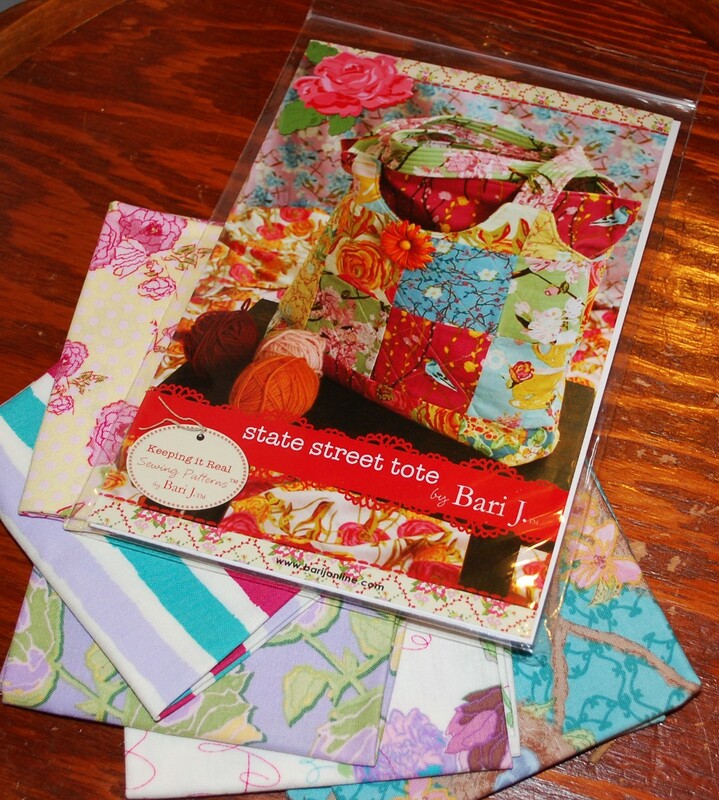 And then last but not least the prize pack….here is the prize….one of Bari’s first printed patterns from this summer, and a fat quarter pack of Art Journal, Bari’s second line for Windham. And here is what you need to do to get it….. This time around we are going strictly by the numbers, a random drawing….and to get your name in the drawing, here’s what you need to do. Sign up to receive Blue Nickel Studios blog updates in your email or RSS feed and come back here to tell me that you did, or if you already are subscribing let me know that in a separate post for a second chance to win. Sign up to recieve BariJ’s blog updates in your email or RSS feed and come back here to tell me that you did, or if you already are subscribing let me know that in a separate post for a third chance to win. Tweet or mention and link to this blog post sharing news about this giveaway and come back to tell me you did for a fourth chance to win. There you go, it’s that simple. Enter in one or all four of the above ways. 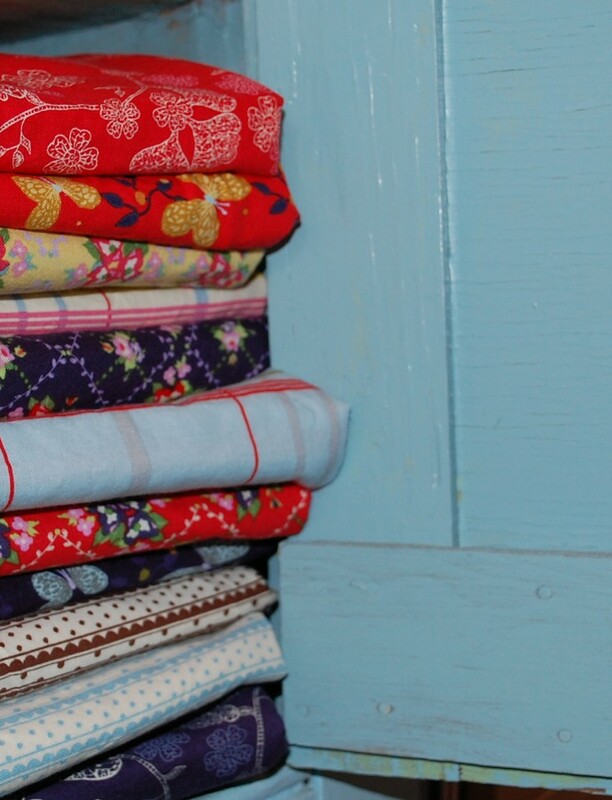 If we get over 200 comments, then I will throw in some large chunks of Country Lane fabric to a second winner. Oh, and I forgot to give an end date to this post originally…..Let’s say you have til October 12th to leave comments, we’ll do the drawing then, okay? Scott, your pattern using BariJ’s new fabric is gorgeous and I have no problem imagining how it looks with the binding. Thanks for sharing the pattern! Please include me in the draw. Love Bari’s new fabric – nice intense and bright colours which I love. Great pattern too! I already follow Blue Nickel Studios on RSS feed and on Twitter – yes I agree, you have worked incredibly hard today! I have just retweeted your Tweet Scott to all my followers. Wow! that fabric is gorgeous! 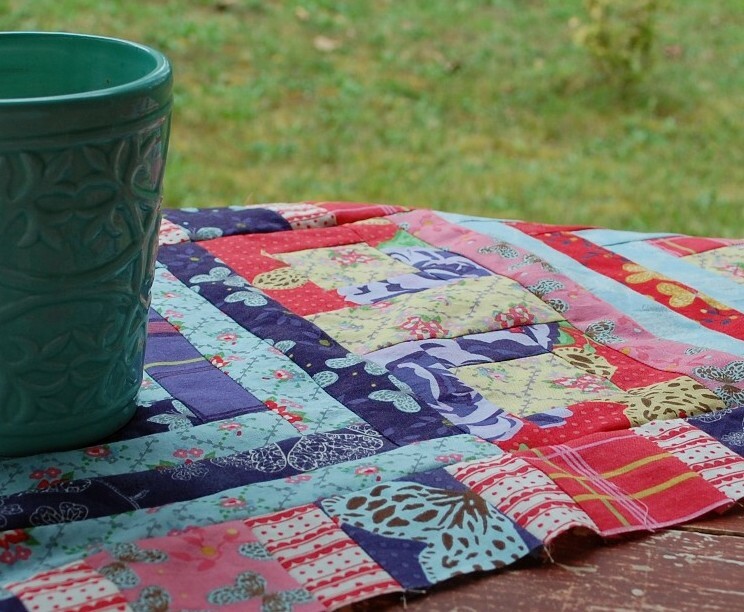 Great fabric, fun interview and I love the table runner! I must make one- the quick finish is an extra bonus! Also I watch your blog in my blog roll… does that count as subscribing? Sure does count!! Thanks Alexis! I subscribe to Blue Nickel already and love it. Do you think Billy Idol might sit down with us for a bowl of popcorn and a movie? We’d have to watch two – Sound of Music is my all time favorite, with West Side Story coming in at a close second! I now subscibe to Bari J’s blog posts! Oh Scott I love your table runner! Super fantastic! And I adore Country Lane! Beautiful Bari J!! Scott I already follow your blog! Love reading it! I already follow Bari J.’s blog. Love her stuff and her new pattern that is coming out! Thanks so much for your tablerunner pattern. I love it! The Bari J fabric is really nice too. I signed up for Bari J’s blog by email. What a fun interview! It got me thinking of a Billy Idol concert in Seattle around 1984/85! Great fabric line! And boy doesn’t it look fantastic made up into your table runner! Thanks for a great post and giveaway! Oooh, and I’m one of your followers too! please enter me in this contest. I enjoyed your questions and Bari’s answers. Thanks. I am already a subscriber to your blog Scott. Love when an email arrives, though I usually click the link to view the actual post. You’re in my Google Reader! Great interview Scott! It’s nice to ‘meet’ such talented people and see what makes ’em tick. Those fabs are color intense! Lovely garden tour in more ways than one. Thanks again for introducing us to Bari and the free patterns. I receive your posts via email. Great chat with Bari J and I love the table runner! I love color! I subscribed to your RSS feed and I’m looking forward to getting your updates as I read each day. I already get Bari J.’s blog updates. Scott, you always do the best interviews! Billy Idol? Never would have guessed! The runner is really beautiful (I’m getting my Country Lane project ready now) and I can’t wait for the tutorial. Your runner is really wonderful. I love her fabrics. I am one of your followers. Great interview! I love that you asked not-so-normal questions. I am a “West Side Story” girl myself. I LOVE your table runner. And I LOVE anything that Bari J does. Thank you for the chance. I subscribed! I already subscribe to Bari’s blog. I love it. I tweeted about your fun interview. Thank you for the chance! Great give away! Love the fabrics and the pattern is great, too! Thanks for letting us get to know Bari J better and for the chance to win! Thank you for doing the giveaway. I just love her fabrics! The runner is awesome as are all of your quilts! Thanks for a chance to win the giveaway. Nice runner. I follow your blog with Google Reader. I hope that counts! I just added Bari J’s blog to Google Reader – I hope that counts! Love this fabric!! Awesome giveaway! I subscribe to BariJ’s blog. Great colourful post! Thank you for the interview and giveaway! I follow your blog on Google Reader – thanks! I also follow BariJ’s blog on Google Reader – thank you for all the inspiration! Oh how i love pink and navy! And the red too! I just signed up To Bari’s blog updates. The colors are wonderful. Thanks for the chance to win. I love the pattern and new line. So bright and cheerful! Also love Bari J’s Art Journal. Am making one of her patterns for my kids for Christmas. Just found your blog and am enjoying it….thanks for the chance to win! What a wonderful giveaway. Beautiful fabrics and pattern! I am a follower of BariJ’s blog. I receive your blog updates in my email everyday. Thank you for the pattern. I love the way it looks in those beautiful fabrics. I have just signed up so that I can receive updates on Bari’s blog also. Thank you!! The fabric & pattern from the giveaway came today and it is beeeuuuutiful! Thanks so much!